And to be honest, you guys are loving it too! Some of my MOST popular posts from the past few months have been pressure cooker recipes! 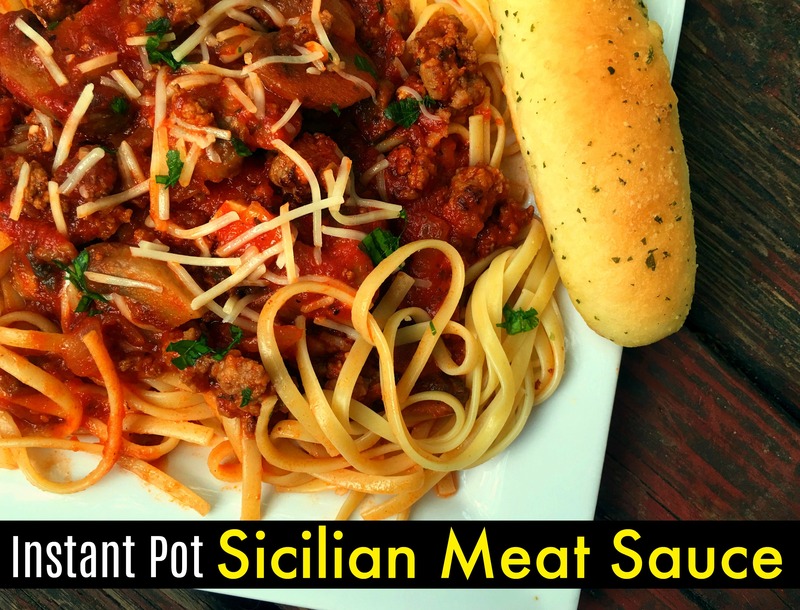 I am so glad so many of you are loving your instant pot as much as I am. Turn instant pot to saute mode on high. Once pot is HOT, brown sausage and beef Once it starts to brown and crumble, add mushrooms and onions and continue to cook & stir for 5 minutes, or so. Stir in minced garlic the last minute. Turn pot to off. Add tomato sauce, tomato paste, water, sugar, salt, parsley, basil, and red pepper. Put the lid on and make sure the valve is turned to the sealed position. Set the pot to manual high pressure for 10 minutes. Once it is finished, allow to naturally release pressure for 10 minutes before quick release. Serve over cooked noodles with lots of shredded Parmesan cheese. ENJOY!!! This looks delicious!! Like I could FACE PLANT in it delicious! Meat Sauce is one of my favorite item. This look so delicious! !